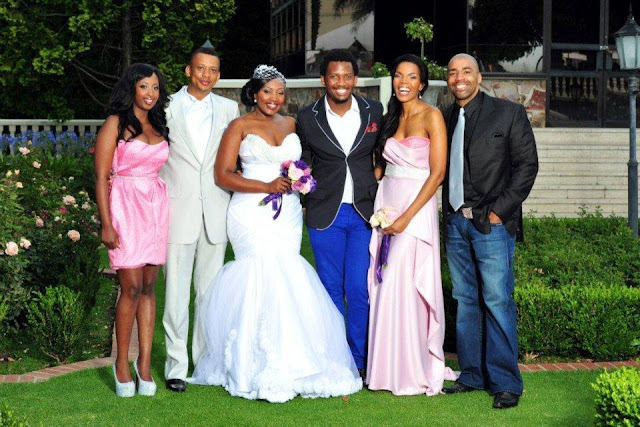 Guests thought they were attending a Thanks-giving luncheon only to be told upon arrival that they are there to witness the wedding of South Africa's darling of television. Woke up this morning coming to Sophie Ndaba's Thanks Giving ceremony, little did most of us know that we were coming to her wedding! 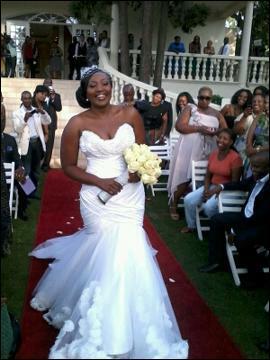 Congrats to Sophie Ndaba. I'd get married the same way. Tell no one and just do it! 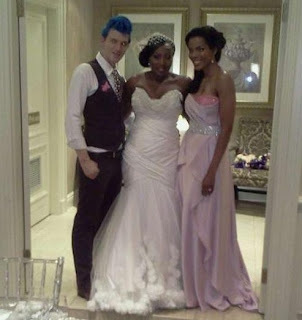 The gushing bride looked radiant in a Gert-Johan Coetzee dress. 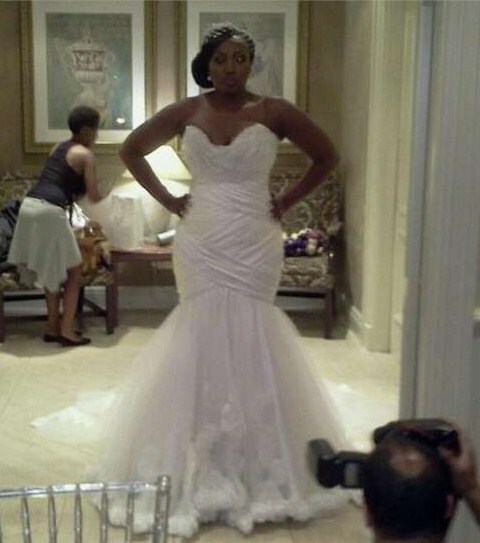 The designer tweeted this picture of the dress. 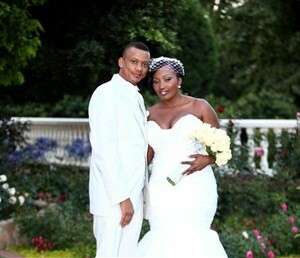 Now you will all not understand, BUT I will say it anyway: "Sophie Ndaba married a CONMAN!!! This man is bad news. Watch this space. I honestly feel sorry for her. That explains why he might have convienced her to keep mum about it. I hope she married out of community of property without accrual. I think people should stop sticking their nose on Sophie's marriage before it even began. This is a domestic issue, let's leave family matters alone. Conman or not Sophie has made a decision. I should believe every woman has a man problem once in a while, so let everyone get on with resolving those. people as they can turn your marriage sour for no aparent reason. People may choose to over-react, truth be told, Sophie MADE A HUGE MISTAKE, period. Move in the Christian circles in Mpumalanga and Limpopo where this guy is well known. He is a gifted speaker with falsified ministerial credentials. There are worse things he does, I promise you, and the newspapers will soon tell his tale to vindicate me. Bishop Dr Keith Clint Harrington IS BAD NEWS!!!!!! Let's give Sophie her space and privacy. She has exercised her freedom of choice period. Sunday World, Please save the world!!! Keith will also account before God for all the marriages he broke whilst pretending to save by initiating affairs with the women in turn. This fake Bishop is a disgrace to the Gospel. I suggest he quites the ministry, and goes into acting on TV!!!! @mohau,stop it wena.where have you met him if not only here.j is eating your but. YOURS! Save your soul,Find the real God,find Jesus serve Him only,read the Bible and ask the Holy Spirit to reveal things to you. God will never mislead you. Stop complaining about someone doing the devil's Work of stealing,killing and destruction. Bishop Harrington and Sophie are blessed by millions of real Christians. I posted the news about their wonderful wedding to 99 countries around the world. I am his witness and don’t appreciate negative stories about him as he is also Vice President of our International University (NWMDIU). Please don’t touch high profile people like Sophie and Prof. Harrington as they influence and bless millions of people and millions of people love them and stand behind them. Remember one day you will stand before God. The times I ministered AND had graduation ceremonies together with him he convinced me 100% that God was leading him by His Holy Spirit. I have done business with him for years and he is absolutely trustworthy. I met his x wife and understand that she remain part of the family as she is also a child of God and both need contact with their children. I have seen several faceless posts on the Internet and would advise everyone to ignore those and mind their own business. Marriage is private between man and wife and they both deserve to be happy. I think their marriage is from God and they will proof all those who are sceptic or negative, wrong. Does this mean no more parties and 20 year olds toy boys for Sophie? Ke mamfundisi now. Good luck they deserve each other. ALILILILILILILILILI congratz sophie and may de gud lord bless u and ur family. Dear Prof De Bruin, You sound sincere in your remarks. However, your averment that you know Keith for 20 years, and yet you are oblivious of the damage he does to the Gospel and other marriages by his dodgy lifestyle around women, says to me he succeded in conning you as well. Fortunately not some of us. This guy has a problem, and if you trully love him, get him councelling asap. He is going to frustrate the poor woman, and bring further disparagement to the Gospel, especially because of Sophie's public image. Many God loving sisters will attest at least to one of the two experiences: How he dubiously extracted money from them, and how he has tricked them into illicit sexual activities. People throwing their toys out are not helping the situation. The brother must repent, and stop using his clever antics to deny the veracity of these statement, IF HE IS A TRUE SERVANT OF THE MOST HIGH ANYWAY!!!!!!! CONGRATULATIONS...may God bless this marriage & may the favour of the Lord our God rest upon this family..I'll keep Prof & sis'Sophie in prayers. favor is proof about grace on lives of people called by God.. He knows more about each one of us. Who am I to cast any stone. We love you Prof. Harrington and may Sophie be your "help" as God intended within His great Plan established in paradise..
Do you really think the Media could find anything negative about our Prof. Keith Harrington if they continue to interview both of them and they are on the front page of the next MOVE magazine? Please pray and give your heart to Jesus! All I can say is that I really feel sorry for Sophie. I've been in the ministry for more than 3 decades and know Keith Harrington. He is BAD news. I personally now Sophie and was one of the guests on the 'supprise wedding' and was SO SHOCKED when I saw him walking down the isle with Sophie. He is a CONMAN I agree with Mohau. If I knew before the wedding took place I could have warned Sophie. She has been CONNED, unless he has repented. I love Sophie, she is so dear to me. May God help you and sustain you! This Bishop/Dr/Professor guy visited our church in Mpumalanga and boy oh boy the man can preach! I wish I owned a private jet to take him away after the preaching. people stop spreading rumours about bishop and mind your own spaza shop . i first knew bishop on yourth camp in tzaneen ,he really can preach and i was blessed .NO ONE IS PERFECT AND AM QUIET SURE THAT MOST OF YOU WHO PASTE BAD COMMENT ABOUT BISHOP YOU ARE CHRISTIANS BY A NAME ,YOU REALLY DONT KNOW THE MEANING OF IT .BISHOP DONT WORRY THEY NEVER LOVED GOD DONT EXPECT THEM TO LOVE YOU .I LOVE YOU GO OUT THERE AND SAVE SOULS . All it has been said 2God be d Glory Amen! If it brings happiness 2d both God is pleased GET OVER IT!!! south africa may not love you, but other countries will recognise the Grace that the Lord has put in you.....mcwaaaaamcwaaaa. lots of love. TOUCH NOT MY ANNOINTED ONE. EVEN JESUS COULD NOT JUDGE THE WOMAN CAUGHT IN THE ACT OF CRIME WHO ARE WE TO CAST STONES INDEED. BEFORE REMOVING OTHER PEOPLES SPECKS FIRST REMOVE THE PLANK ON YOUR EYE. lOVE YOU SOPHIE AND DR KC. keith , just be strong and be focused God will help you. My brother i once had accusations and my wife turned against me but an angel was sent to me and i was referred to a GOD FEARING LOVING ANOINTED WOMAN , I POURED MY HEART OUT TO HER, SHE ACCEPTED ME AS A BROTHER, MAN OF GOD AND SHE HELP ME , ACTUALLY SHE HELPED ME TO SEE MY MISTAKES AND TOLD ME THINGS THAT WERE ONLY KNOWN BY ME i.e. my past , she prayed and this woman of God was in tears . after prayer she commanded me to go home and talk to my wife for my surprise when i arrived home, my wife was no longer angry and i quickly spoke with her and she was quite not interrupting me as she will always do. after i delivered or confessed everything she said truly God loves you ,who helped you cause there is nothing that i can judge you with, I HAVE FORGIVEN YOU AND SHE WENT IN PUBLIC TO SAY ,"EVERYBODY HAS SOME FAILURES ,THAT IS WHAT LOVE IS . THIS GOD FEARING WOMAN DIDN'T CHARGE ME A CENT . PLEASE KEITH GO AND SEE THIS WOMAN AND GOD USES HER MIGHTLY , YOU AND YOUR WIFE WILL BE HAPPY UNTIL JESUS COMES BACK. SHE LOOKS VERY YOUNG BUT HTE ANOINTING WILL DO THE JOB ON YOUR PROBLEM. Mr Mohau , why are you so bitter to Prof keith Harrington , were you hoping to marry Sophie ? Look man and grow up if you are happily married why dont you help them with brotherly love , but from your kind of mind it seems as you have your own problems that you can't handle at home . your wife doesn't know that your such a failure to the entire world and to the nation of Mzansi. you have a big empty mind that fails to improve itself. Sunday world claims that Harrington's degrees are fake.. so what? he is not a brain surgeon with fake medical degrees. As long as he doesnt harm anybody leave the man alone let him enjoy his life.They also claim he is Nigerians now i want to know if Nigerians arent human being created in the image of God like all of us? We all make mistakes so lets back off and let the man enjoy his life. God help these people who call themselves man of God. Mr Mohau thank you very much for telling the truth. You were right this man who claims to be the pastor is now a FONG KONG. As for Sophie to be CON by a nigerian man. I was thought celebrities are smart. Shame on you Sophie. If you that desperate to get married what are you saying now. Why women put pressure on themsleves like this. A nigerian tjo you are brave or stupid indeed. As for this international that claims knowing this Fake man for 20 years. You are the one who needs serious prayers including your so called PASTOR. I HATE ALL THESE FOREIGNERS WHO COME HERE AND PRETEND TO BE PASTORS. THIS IS A WAKE UP CALL TO ALL SOUTH AFRICANS. WAKE UP THESE PEOPLE ARE HERE TO MAKE MONEY. I always ask myself what is wrong with our brothers and sisters to be stupid like this. How many churches in South Africa owned by these FOREIGNERS. Geez they know how to make money. What sickening me is the fact that they don't even have shame to rob poor people and yet claims to be be Christians. Mr Mohau I am saying this again thank you for spreading the truth. You are indeed a good man. People don't want to hear the truth they would rather be told lies like these so called PASTORS are doing. I am saying this again WAKE UP SOUTH AFRICANS. THESE FOREIGNERS ARE HERE TO MAKE MONEY AND THEY ARE GOOD AT DOING THAT. Have you seen an ordinary FOREIGNER without claiming to be a DOCTOR OR PROFESSOR. THIS IS REALLY SICKENING. AN ANGRY SOUTH AFRICAN. CAPE TOWN. PERSONALLY, I WANT TO ASK ALL WHO QUESTION HIS LIFE, LETS US HEAR YOUR SINS, PLEASE BE BOLD ENOUGH MOHAU TO TELL US YOUR MANY SINS WHICH YOU HAVE DONE IN SECRET THE SAME WAY YOU DID WITH KC HARRINGTON, COME ON, YOU ARE CLEAN ARENT YOU, YOU HAVE NEVER LIED, NEVER SAID ANYTHING WRONG? I ALSO CHALLENGE YOU MOHAU AND THOSE WHO SAY HE FATHERED 8 CHILDREN IN 3 MARRIAGES. HOW MANY OF YOU HAVE BROKEN PEOPLE'S LIVES, HOW MANY OF YOU HAVE CHILDREN BEYOND YOUR NOW MARRIAGES? HOW MANY OF YOU ARE TRUE? YES, BLAME HIM, IT IS OK, BUT EVEN YOU WILL ACCOUNT ONE DAY FOR YOUR HIDDEN SINS BEFORE JESUS CHRIST, THE SAME WAY HE WILL, ATLEAST HARRINGTON'S ARE KNOWN AND EXPOSED, YOURS ARE HIDDEN UNKNOWN FROM THE PUBLIC- BUT THEY ARE KNOWN BY GOD. JUDGE NOT, LEAST YE BE JUDGED. I AM NOT STANDING FOR KC HARRINGTON OR YOU, ALL HAVE SINNED AND FALL SHORT OF THE GLORY[PERFECTION], INCLUDING ME, YOU AND KC AND SOPHIE. ALL HAVE SINNED, MOHAU TELL US IF YOU HAVE NOT SINNED, I HAVE, KC HAS, SOPHIE HAS, WE SOUTH AFRICANS HAVE, YOU HAVE, HAVEN'T YOU MOHAU AND THE ANNOYMOUSES? TELL US YOUR SINS SO WE CAN KNOW YOU BAD YOU ARE TOO, YES, PASTE IT SO WE CAN READ ABOUT YOU TOO. Who ever you are you should be ashamed of yourself. Why do you choose to be an idiot when God gave you brains to think. I am not and Mohau is definitely not an idiot. Now you running away from the truth and using God again you fool. Read here and read careful you fool, WHAT EVER WE HAVE SINS OR NOT IS NOT THE MATTER HERE. THE MATTER HERE IS YOU CLAIMING TO BE A CHRISTIAN AND STILL LIE ABOUT WHO YOU ARE. Don't you people have shame, how do you people sleep at night. NO WONDER THIS WORLD IS LIKE THIS IS BECAUSE OF YOU PEOPLE. YEER GOD'S NAME IS USED FOR EVIL DEEDS. I WILL PRAY FOR YOU AND YOUR SO CALLED PASTOR IF ANYWAY YOU NOT THE ONE. all i want to know is the truth,is it truth? Someone above refers to Prof LM De Bruin's New World Mission Dunamis international University (NWMDIU). As you would recall, Prof de Bruin responded to my postings on 06 Jan 2012 (above). Prof de Bruin and Keith are both Professors at NWMDIU. I made the following observations on their website: pictures of this university are missing; no landline number but a cell number, prof de Bruin uses a g-mail account for his e-mails (and not a Univerity account); e-mails are supposed to be sent directly to him (and he is the President of this University!!!). Does this University exist at all? Sunday World, over to you!! !I do not know De Bruin, but I view anything associated with Keith with a pinch of salt. For me, the reputation of Keith around women concerns me even more than his lies about his origin and credentials because he generally pries on very vunerable souls. Those who throw tantrums about "who does not sin" miss the point: The difference is that Keith is in a position of trust!!! He is supposed to be a mouthpiece for God on earth. People will generally trust a Pastor/Priest before they trust all of us. That is the danger when such trusted person suffers from moral bankruptcy. Being a conman he is, he will destroy many people if not stopped. This is the TRUTH!!! Well said Mohau, I totally agree with you. Where is Prof De Bruin now.It is said that he is charging other fellow ministers R6000 to award then fake PhD's.Is this the same person who awarded Rebecca Malope an PhD? THANK YOU MOHAU, WHERE ARE THE SO CALLED CHRISTIANS WHO WERE THROWING STONES AT YOU? I think they owe you an apology instead of preaching their nonsense about sinners. I am so happy that Sophy came public on Sunday Sun in defense of her husband. People will talk until they keep quite the Pastor is Sophy's husband period! I think you are getting ahead of yourself on this point. IF the reports in the Sunday World are accurate, then Sophie and Keith are NOT married under SA law - or under any law for that matter. 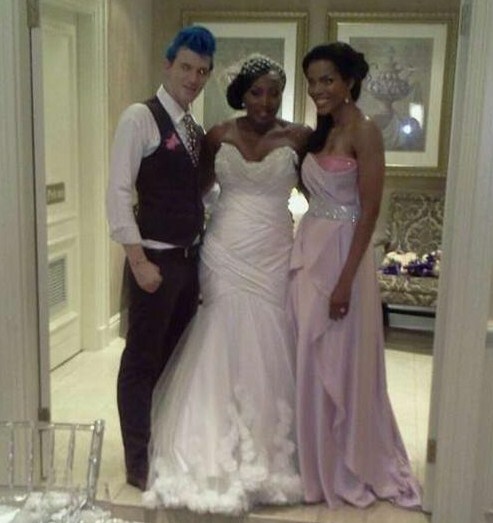 It would appear that they have not registered their marriage under SA law. Hence, any defence of this man on her part is a defence of her "pastor" live-in-lover, with whom she threw a lavish event in Dec 2011. It would appear that he is not her husband. Let us not play with the facts here. Furthermore, any "pastor" "living in sin" has no right to take the pulpit. No right whatsoever. He also has no right to hold the position of an elder. This is the Biblical standard - irrespective of what pseudo-Christians may proclaim to the contrary. The Name of Christ should not be mocked and defiled in such an appalling fashion. Anonymous (11:05)you took words from me. As a Christian, I am now really saddened by the degradation, moral decay and scandals that characterise the Church these days. Pastors are ever increasingly leading the pack in this ragard. It is worse when they try to deny in the media what is pretty much in the public domain. That explains why Sunday World refused to be intimidated with gagging by Keith's lawyers. Also, if you read the papers carefully, Keith does not deny his shameful shenanigans over the years. I know that some God- fearing pastors have already seperated themselves from him, lest they get "cut by shrapnels". We need men of God in word and in deed, so that they can lead us to the alter of total surrender to the Almighty God. Not the kind that will sexually molest the very souls they must lead to God. As for this so-called marriage, it is a further disgrace as it constitutes no more than cohabitation by the "Bishop". Personally, i think Keith must leave excuses, and apologise unconditionally to the people he has been hurting over the years.In his position, I would also refrain from pastoring a church because of badly tarnished Christian witness. It is a pity that we have so many "Christians" out there who are more devoted to Harrington than they are to Christ Jesus. Why is there no zeal for holiness and the honour of Christ's Name? Instead, we have lousy excuses being made for Harrington - some are even misusing the Scriptures to shield the man. My comment to such people is "let Harrington save you", as he is clearly the one you worship. Do not profess Christ and, in the same breath, support those who unapologetically dishonour His Holy Name. Thank you to the people who stand up for their God like Mohau. the "Daniels" of this generation. I was shocked to read the commence that came from so called christians "blessing the adulterus relationship". I was wondering how they understand their bible, what God says about marriage and divorce. South Africa can not afford to have such role models. Family strucure is the foundation of the nation. if the foundations are destroyed we dont have a nation. Please christains stop condoning sin and stand for truth. The fact that the pastor is divorced (even more than once)says a lot about your values if you condon it. Let us go back to God. South Africa repent. Meleko feela khelek...che lefats'eng mona re bona meleko joale tjena! ksoooooooooooa! Ho bolile!!!!!!! Jesus, come for your Church before the wolves finish us all! This is so shcoking and a total disgrace if peopel can lie with GOD name and pretend to be pastors. Mind you one dod not need to have PHD to preach hence it is a gift from GOD. I hope that all that have been said is not true and its all a movie. But if it is true this is a big lesson learned for women expecially not to trust anyone so easily. A certain lady from Kwagga was bought to claim she had AIDS and Harrington cured her.We followed her months after Harrington had left and she confessed to have been bought. @ Mohau well said, where r all these so called christians who've been attacking u? Reading 4m all the previous comments where is International thoughts? It is written in the bible there will be fake Prophets that Bishop must repent, If he is really from Nigeria anything that is written about him can be true. I know what Nigerians are capable of, no offense to Nigerians though but we all know what they can do. Anyway I feel sorry 4 our most loved actress (Darling) Sophie to fall for this Conman. Everything about Keith Clint harrington that's if that is even his birth name. I feel sorry for Sophie to be dragged in this shameless marriage. But hey she is a grown up woman to be able to know the truth.What a bad way to start so called marriage. Sophie should be thankful to god for showing her the light form the begging about this man. Instead she chose to be deaf and ignorant. As for her to say I stand by my man. Anyway I think she is embarrassed more than anything but if I were you I would do the right thing and walk away. WALK AWAY WHILE YOU STILL CAN. People make mistakes because they are pleasing other people and compromise their happiness in the process. As for this CONMAN to say he is sorry and he was still in his 20 when he fathered a child with a 12 year old. He is a disgrace in our society and should be treated like a criminal. He is still lying about his fake DEGREES and says everybody in that institution is dead including his Supervisor DR STRANGERS. SOPHIE ARE YOU THAT STUPID OR BLINDED BY LOVE TO THAT EXTENT. THIS MAN IS BAD NEWS FINISH AND KLAAR! zimbi lezindaba mfundisi uzolithetha icala one day. Sophie and Keith's marriage is over!!! Where is every stupid Christian who denied the bishop was a conartist? The marriage is now over. Finally Sophie has come to her senses. I am proud of you my dear for claiming your power back. You don't need that foolish man. A leopard never changes its spot. You did yourself a huge favor and children. Thanks to Mohau for being an honesty man. There are very few good man like you. You did the right thing. Conman must go to other conwomen. You did not deserve Sophie in the first place. @ Mohau to God be the glory. Well done. Fight for the truth and you are Blessed alreay. Pips like Pastor K are roaming around. I also support Mohau that they need to be stopped. I was also conned by the so called Pastor and I was a Widow. Now am paying him R50000 for divorce settlement of which he never spent half of it while he was married to me. I had to loose my belongings. He was controlling my money and went to an extent of asking about my kids investment and forced me to sell da house and move somewhere. Thank God I didn't sell the house. Am happy now but I know such people do exist. A big "Thank You" is in order to all Christians who supported me when I was under a gruesome and ferocious attack on this blog. I truly appreciate it. Even though we have not met in person, we have done so through the same Spirit Who lives within us. He has establised a bond of truth, and transcendental connectedness that defy human limitations and boundaries. The wolves are amongst us, seeking whom to devour. We must continue to tell the truth without fear, favour or prejudice. We must uphold the flame of truth in the midst of insumountable difficulties. Remember, the Harringtons of this world are not necessarily easy to detect, and even more difficult to take head on. They are eloquent people who pry on the gullible, yet well-meaning masses. You and I have a huge responsibility. To God be the glory. Honour and praise to the Ancient of Days!!! !